On 16th July, Pakistan’s first ever mechanical heart transplant was successfully performed by a team of doctors at the National Institute of Cardio Vascular Diseases (NICVD), Karachi. Nafeesa Begum, 62 years old cardiac patient is the first patient in Pakistan to undergo this surgery and receive a mechanical heart transplant for the first time in the country. This kind of technology was not used earlier in Pakistan. Administrator of NICVD Dr Hameedullah Malik said the woman’s heart was only 15 per cent functional prior to the surgery but all other vital and other internal organs were working normally. He further added that the patient is doing fine, and would be shifted to the Intensive Care Unit (ICU) soon. Dr Malik said, “We had been working on structuring this department for about six months now.” When a question asked about the difference between a regular heart transplant and a mechanical one, Dr Malik explained: “A regular heart transplant is as though inserting a new heart in the body but in a mechanical heart transplant the organ is not replaced, in fact, the valve or the pumping mechanism is fixed by using a device. This device then pumps blood across the body”. The surgery was performed by Dr Pervez Chaudhry, who joined the NICVD team on the request of Head of NICVD Dr Nadeem Qamar, along with his team that consists of eight cardiological experts. Dr Malik told the procedure costs around a crore and at the moment, it is funded by donors and NICVD. 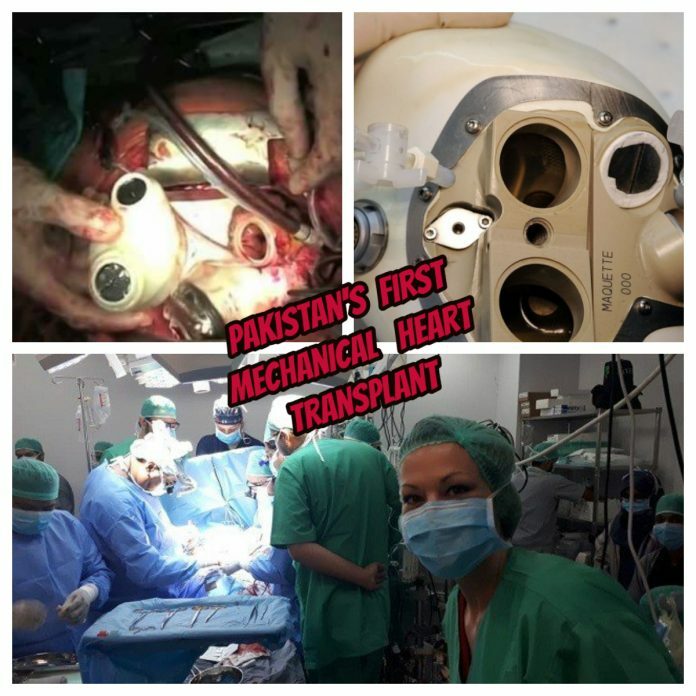 The successful mechanical heart transplant will give confidence to Pakistani doctors to explore more about the surgical processes. Moreover, this will also open a gateway to new researches in the field of science and surgery in Pakistan and patients will now be able to get the treatments done without travelling to advanced countries.